Nathan Phillips Square brings back many childhood memories since I tried Ice skating for the first time at this skating rink. Located in the heart of the city, Nathan Philips Square is a vibrant place that hosts many special events all around the year. 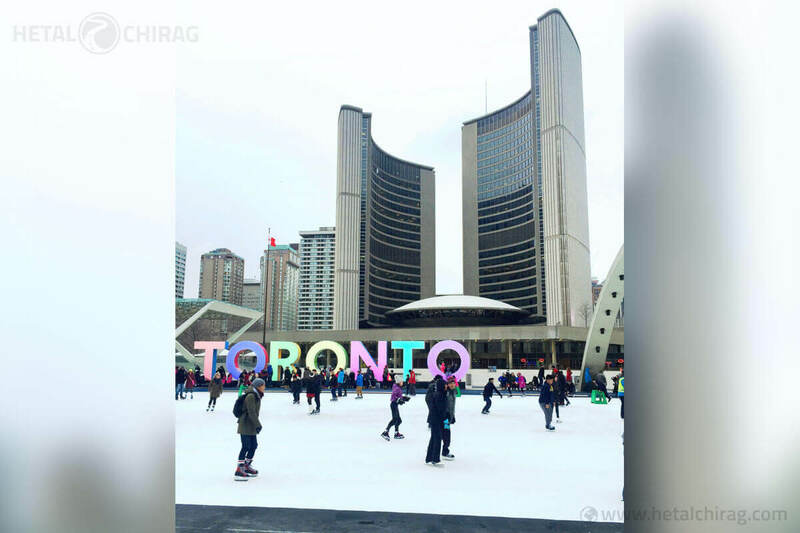 If you visit Toronto during winter and love ice skating, you have to visit this iconic ice rink. Did you know that this square was named after Nathan Philips, the mayor of Toronto from 1955 to 1962? During spring and summer time, you can enjoy cultural shows, dance performances, concerts by local artists. If you are a foodie, you can explore delicious street food during special events or go shopping for fresh produce at the farmer’s market. When you visit the Nathan Phillips Square, you should also check out the beautiful harbour front of Toronto. If you go on an evening harbour cruise, you can witness a beautiful sunset as well as an amazing view of the city at night with a colourful display of lights. The view of iconic skyline with a CN tower standing tall besides the SkyDome is remarkable. I was 16 years old when I went on a Toronto harbour boat cruise for the first time in my life. From that high school trip to the more recent MBA get-together, I had a chance to go on quite a few harbour boat cruises and canoe trips on Lake Ontario. And I must say the view of the Toronto’s skyline from the water was spectacular back then as it is today. While you are exploring the Toronto Harbour, you should also go island hopping and enjoy a nice canoe trip on the calm waters of Lake Ontario. Did you know that Lake Ontario got its name from an Iroquoian language which means “lake of shining waters”? Formed by melting of glacier, Lake Ontario is the 14th largest lake in the World. After you explore the Harbour front, You should also check out the famous CN tower. Your visit to Toronto would be incomplete without experiencing the breath-taking view of the city from the top of the CN tower.